Hyper Light Drifter, the Kickstarted debut combat RPG from Heart Machine released last month, is receiving a co-op mode in the Steam test branch of the game. Like your quirky games from tiny teams? Here are the best indie games on PC. The game, which drew immediate comparisons to Dark Souls in mechanics and gameplay difficulty on launch, will now offer local two-player sessions if playing on the opt-in beta build. Directions on how to opt into the trial are here, and the branch will remain live until May 2 at 1am EST when it will be brought offline for final completion. 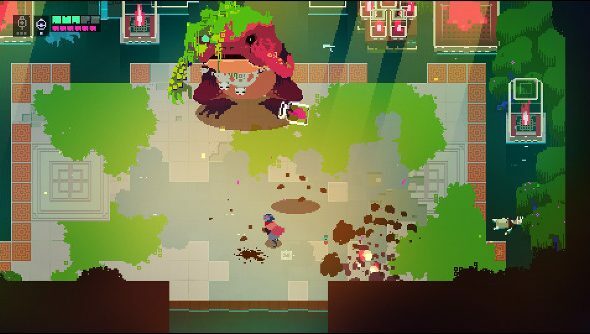 Hyper Light Drifter drew wide acclaim for the atmospheric visuals and audio from composer Disasterpeace (of Fez and IT FOLLOWS fame) while some critics lamented the difficulty of an otherwise satisfying combat loop. A few patches since launch have hoped to address these comments, while trying to keep the game of the ‘harsh but fair’ variety, by introducing invincibility frames during dashes (or drifts) which form an integral part of battle. Perhaps adding a second person might also help bring the difficulty to a manageable level, though one of you will need to play on keyboard and mouse while the other gets the gamepad. Ah, the good old days of PC gaming.